Our first half term in year 1 has been super exciting. We have all settled in well and enjoyed exploring our new classroom. We have been very lucky to get lots of new resources meaning we can use our outdoor classroom as part of our learning. Science: This half term our topic has been animals including humans. We had lots of fun exploring and learning all about our 5 senses. We carried out taste tests for our sense of taste. The marmite was not very popular. We did a sound walk around the school and grounds to see what different types of sounds we could hear. We used feely bags for our sense of touch to feel lots of different textures and we carried out smell tests for our sense of smell. The flowers were our favourite. We have had a super exciting week exploring forest/nature week. We have been lucky enough to go on 2 trips. On Wednesday we visited Fanwood were we explored the woodlands and did lots of fun activities. We went on a scavenger hunt where we had to use a map to follow a trail to find all the woodland animals. We also made our very own paint brushes using sticks and leaves. We then used these to paint our own pictures. It was lots of fun. We finished off our visit by having hot chocolate and biscuits! We also visited Green Moon this week. We started off by eating our dinner around the campfire and roasting our very own marshmallows. We then went on a trail to find the troll who lived under the bridge before making our very own houses for the fairies using twigs, sticks, leaves and objects we could find in the woods! We used our imaginations and created some amazing houses! Literacy: This half term we are focusing on the Author Julia Donaldson and using her stories to help us to develop our sentence structure and retelling of stories. We are also focusing on the key features of the story (beginning, middle and end). We have enjoyed looking at the story 'Smartest Giant in Town'. We learnt the story and some of us even dressed up as the characters and acted it out while the rest of the class re-told the story. This was lots of fun! This week we have been celebrating other faiths week. 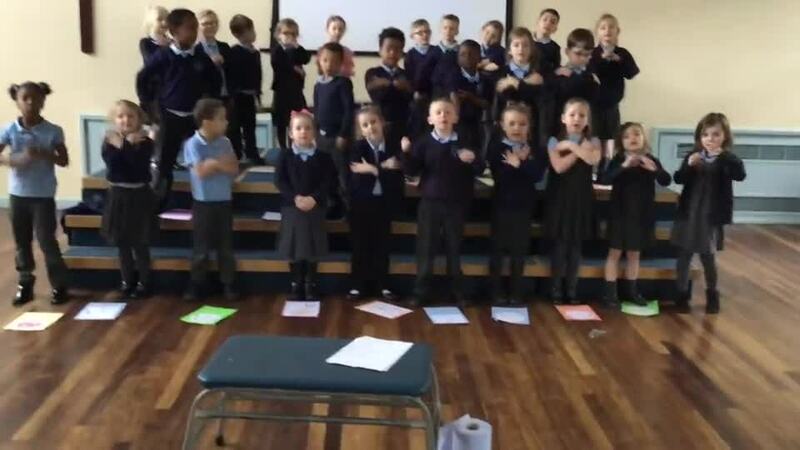 Year 1 were given the faith Judaism. We learnt about their faith and even had the chance to visit a Jewish Synagogue. We learnt all about the faith while we were here. When back at school we then used play dough to recreate the Synagogue to make our own version. Literacy: This half term we have been focusing on Traditional Tales and the features of these. We have been exploring the story of the Three Little Pigs. We looked at how the story has a beginning, middle and end and then retold each part concentrating on what is included in each. We then innovated the story by changing the character of the wolf. We all had lots of ideas of what we should change it to but we decided to go with either a tiger or a gorilla. We had lots of fun writing the story again with our changed characters. We even wrote and made our books. Topic: Our topic this half term is Toys from the past. We have had lots of fun comparing our toys now to the ones that people had many many years ago. We even asked all our Nanas and Grandads what their favourite toys were when they were children. We were super lucky to visit Abbey House for our school trip where a lovely visitor taught us lots about the toys from the past. We learnt what they were like, what they were made from, how they were used and she even let us have a go. Take a look below at all the fun that we had! Literacy: This half term we are focusing on Instructions. We have learnt what the features of instructions are and whats included in them. We have had a go at ordering instructions and we gave Miss Vickers instructions on 'How to make a Jam Sandwich. This was very fun! She was very silly and used her hands to spread the butter and try to cut the sandwich because we forgot to tell her to use a knife. We quickly corrected the instructions though so she managed to make her jam sandwich correctly. It was very tasty! Science: This half term our Science topic is 'Everyday Materials'. We have been exploring all the different types of materials and what we can find in the classroom made of those materials. We have also carried out a paper experiment to find our which type of paper is best for painting on, drawing on with a pencil, wax crayon and felt tip and soaking up spilt water. We experimented with 5 different types of paper. Writing paper, wrapping paper, grease proof paper, glossy magazine paper and tissue paper. We had lots of fun doing this. Year 1 had a fab time celebrating world book day this Year. We all dressed up as our favourite animals from our favourite books and all our costumes were great! We did a special Assembly to celebrate Mothers day and all our family came to watch. We even looked at how it is celebrated in some of the other home countries children in Year 1 are from. We ended by dancing to a silly Mother's Day song. Take a look below. Religious Education: In RE we have been learning all about Palm Sunday. We now know that Palm Sunday is the beginning of Holy Week. 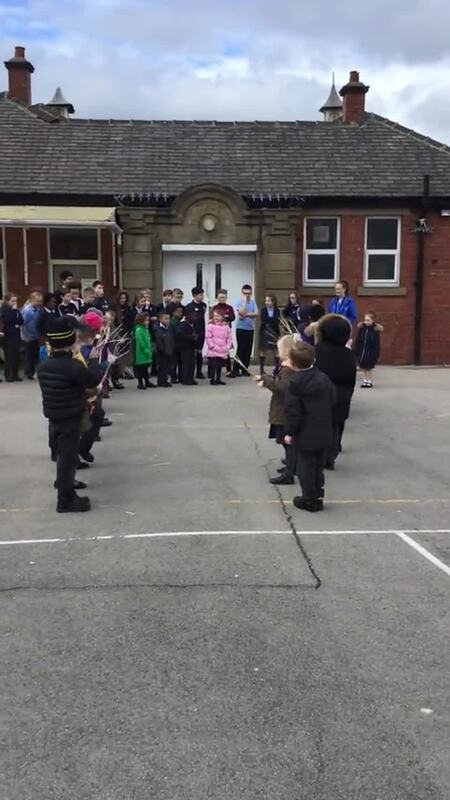 We decided to act out the story as a class and Year 6 came to watch our performance. They were very impressed! Literacy: This half term we are looking at the features of Fantasy Stories. We are going to use the story 'Whatever Next' to help us do this. We have used T4W to help us learn the story and made actions so we can act it out. Take a look below.